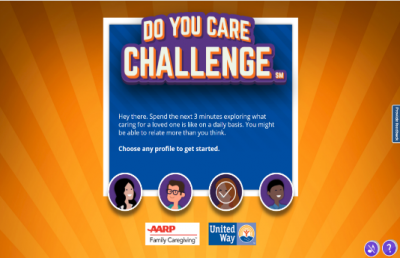 WASHINGTON, DC—AARP and United Way Worldwide today announced the debut of the “Do You Care ChallengeSM,” a new easy-to-use interactive online tool that lets people get a sense of what “a day in the life” is like for a family caregiver. The tool was developed to help raise awareness about the surprising number of millennials ages 18–34 who are family caregivers and to encourage employers to create more caregiving-friendly workplaces. There are approximately 40 million family caregivers in the U.S., according to AARP. The majority (60%) of caregivers are employed full- or part-time. Although many people may think of caregivers as being older adults, 25% of family caregivers are millennials under age 35. The average millennial family caregiver has been caring for a loved one for nearly three years. The “Do You Care ChallengeSM” walks people through different scenarios of the daily decisions and challenges facing a typical family caregiver, including a single mother working two jobs, a full-time college student, and a married father of two, all millennials and all trying to assist a friend or other family member at the same time. The new tool provides helpful tips and resources, including links and telephone numbers for people to get assistance or obtain additional information on caregiving. The “Do You Care ChallengeSM,” can be found here: www.DoYouCareChallenge.org.